The differences between .223 Remington and 5.56mm NATO have been hashed out many times on the internet. Unfortunately, many of the “facts” that are often thrown around are simply what someone has heard from someone else, leading to a lot of misinformation being accepted as gospel. 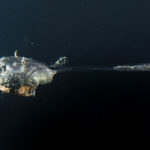 In order to create this article, I temporarily set aside all of my previous knowledge and opinions while several months’ worth of new research and experimentation on the topic was undertaken. In addition, extensive discussions with gunsmiths, ballisticians, and laboratory technicians were conducted. My findings, and the opinions of many experts in the industry who deal with the topic every day, were not exactly what some might expect. In fact, many of them had already discovered what I am reporting, although my research was conducted independently. This article is not a recitation of previously existing information. It is quite long and complicated; if you don’t have the time or inclination to read everything, a (bold ) summary may be found at the end of most sections. However, I attempted to write it in a manner which should be easily understood by all – so if you want to read the whole thing, you will come away with a more complete understanding. This video summarizes LuckyGunner Lab’s findings after thoroughly pressure testing 5.56 ammunition against .223 Remington ammunition in a variety of chambers. You should never fire 5.56 ammo in a .223 chamber…right? What would happen if you did? The exterior (physical) dimensions of .223 and 5.56 ammunition are effectively identical. 5.56 ammunition may be loaded to higher pressures than .223 ammunition. 5.56mm chambers are dimensionally larger in certain critical areas than .223 chambers. Given the same ammunition, 5.56 chambers will have lower pressures than .223 chambers. How are .223 and 5.56 Ammunition Different? The development of what has become .223 and 5.56 began many, many years ago. You can find an excellent history of this development on SniperCountry.com. There is little point in restating what has already been written well. 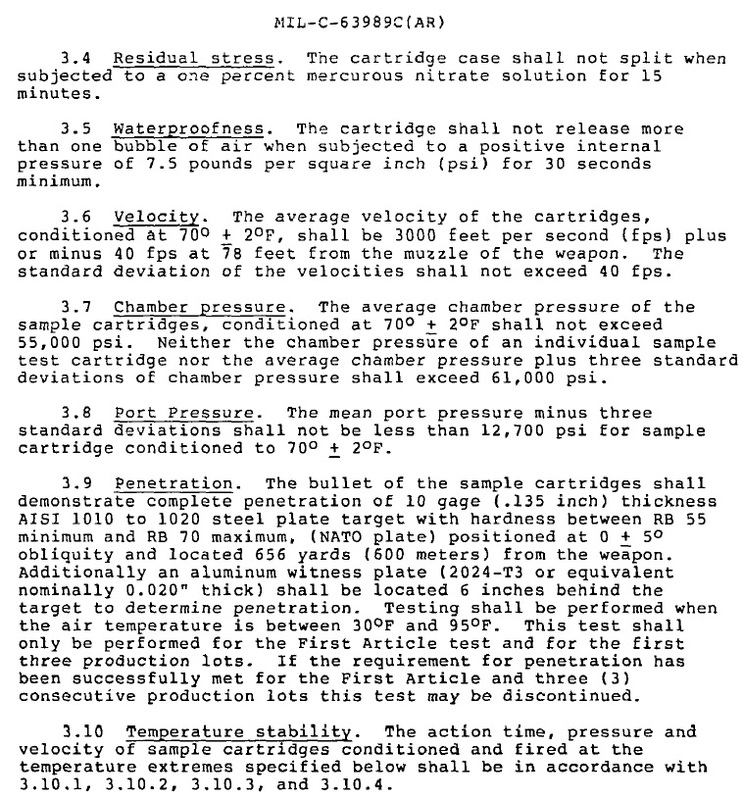 However, it’s important to note that as military development of the 5.56mm cartridge has required higher velocities (via higher pressures), civilian development of .223 has essentially remained frozen since December 1962, when Remington submitted the cartridge for standardization by SAAMI. You’ll note that I didn’t say 5.56 was standardized by SAAMI, and that’s because it hasn’t been. 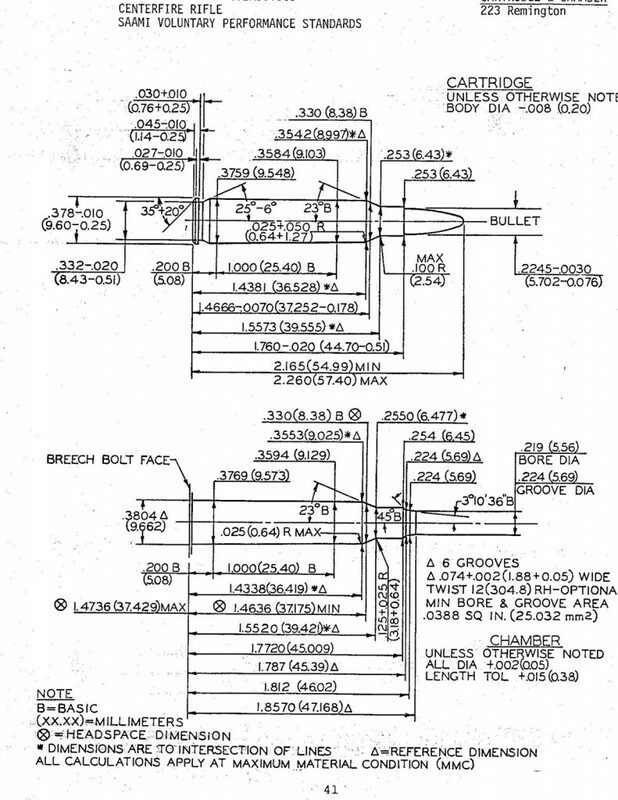 Only the dimensions and pressures of .223 Remington have been standardized. Can you tell which of these rounds are .223 and which are 5.56? Because .223 Rem and 5.56 NATO share the same external dimensions, it can be hard to tell the difference. Because SAAMI specifies that pressures must be measured one way and the military specifies that they must be measured a different way, a direct comparison of pressure results from one lot of 5.56 ammo (measured the US Military way) with another lot of .223 ammo (measure the SAAMI way) is not possible. It’s required to test both with the same methods, instrumentation, and chamber to see any real differences. Theoretically, any manufacturer could make ammunition which exceeded the maximum pressure specified by SAAMI for the .223 cartridge and call it 5.56. That pressure could be exceeded by 1% or 10% – it really wouldn’t matter. 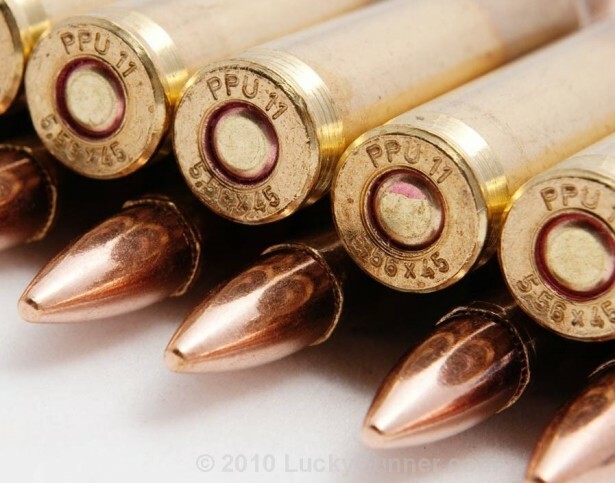 It’s the functional equivalent of “+P+” ammunition – there are no official guidelines for it which ammunition manufacturers have agreed to follow, as is the case with SAAMI. 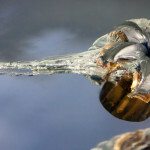 You could almost consider it to be the world’s most popular wildcat cartridge, as far as SAAMI standards are concerned. Despite this lack of SAAMI standardization, most of the 5.56 ammunition on the market is manufactured by companies that produce 5.56 for various militaries; the 5.56 they sell to civilians is essentially identical, and thus follows the requirements and maximum pressures set forth by those military clients. As you can see from this short excerpt from a 27-page specification for US Military ammunition, military requirements are very exacting. 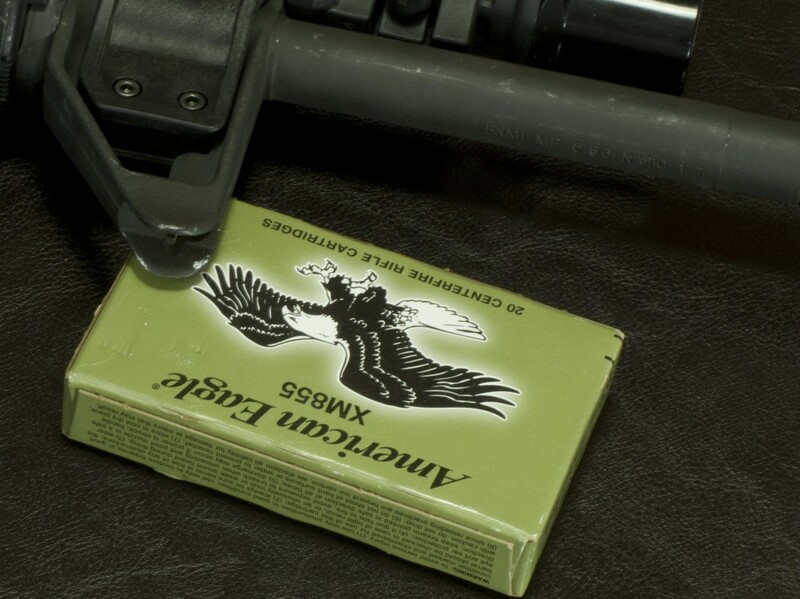 Military requirements for ammunition are quite stringent. But those military clients are purchasing ammunition for military rifles, which brings me to the next difference between the two: chamber dimensions. Summary: While .223 Remington chamber dimensions and maximum pressures have been standardized by SAAMI, 5.56mm NATO dimensions and pressures have not. Partially because of this, ammunition pressures are measured differently between the two, and cannot be easily compared. Still, it is generally agreed upon that 5.56mm ammunition may be loaded to higher pressures. If you’ve read about this topic before, you’ve been told not to fire 5.56 in a .223 chamber. The possible results from this, you may have been told, can be catastrophic – the destruction of your firearm, and, at the same time, you might be injured or killed. It’s scary, but not quite true. 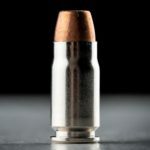 .223 Remington ammunition is pressure tested in what is called a “SAAMI Minimum Spec” chamber – that is, a “worst case scenario” chamber in this regard, made to the smallest dimensions, which would result in the highest pressures with any given ammunition. In reality, the likelihood of encountering such a chamber outside a testing lab is incredibly small. Many .223 Remington chambers will see maximum chamber pressures which are several thousand pounds per square inch (PSI) lower than those seen in SAAMI test barrels. These SAAMI specifications for .223 Remington chamber dimensions allow for a range of minor differences between manufacturers. At the other end of the spectrum are 5.56mm NATO chambers, which will exhibit lower pressures than .223 Remington chambers with the same ammo. Sometimes, even 5.56mm dimensions are exceeded. 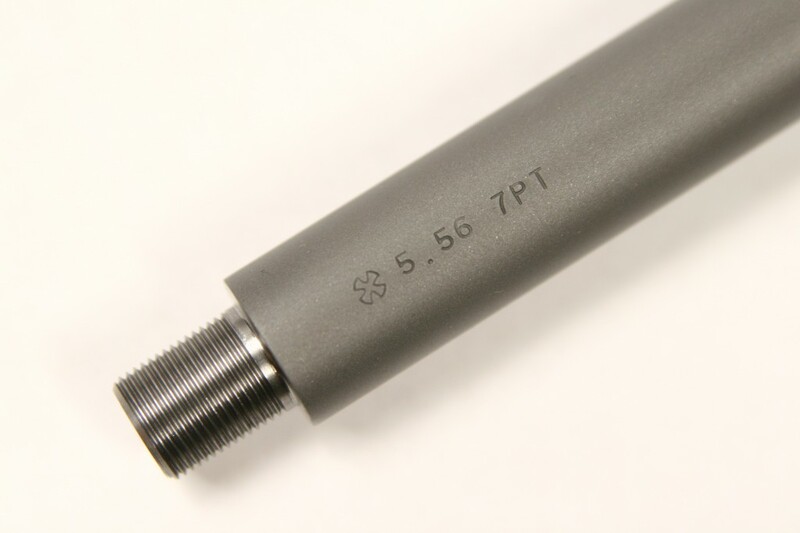 These “5.56mm Plus” chambers are sometimes reamed (machined) intentionally to provide the most insurance against excess pressures, but other times they’re just the result of careless machinists. In between are chambers designed to balance pressure and accuracy, for the long freebore and throat dimensions of 5.56 NATO chambers are often blamed for reduced accuracy in comparison to .223 Remington chambers. These include .223 Wylde and 5.56mm Noveske Match Mod 0. Even among these, there are differences in reamers – one company’s idea of .223 Rem is not the same as the next. Take a look at this comparison chart and you’ll see a dizzying array of differences. 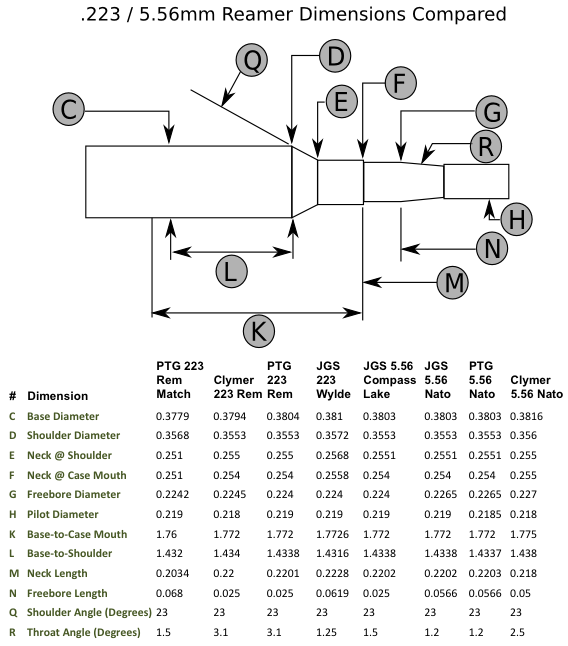 This chart shows a wide variety of differences between each reamer company’s idea of .223 or 5.56 chambers – and it doesn’t show all of the variations on the market (data courtesy of AR15Barrels.com). What all of these chambers have in common (with the exception of the Noveske chamber, which is produced by only one shop) is that they are reamed by a wide variety of machine shops and personnel who may or may not be experienced, skilled, or caring. When you buy, for example, a .223 Remington rifle, you’re probably not getting a chamber that’s identical to the others on the shelf. The Maltese cross is used by Noveske Rifleworks to identify the proprietary 5.56mm chamber reamed in their barrels. You’re getting one that is, if it was manufactured by a reputable company, somewhere within the range of acceptable tolerances for a .223 Remington chamber. If it was made by a company with more of an emphasis on cost savings than exact machining, it could be a minimum spec .223 chamber, or something that is closer to 5.56, or anywhere in between. Even between chambers reamed by a reputable company, differences exist, as you will see. 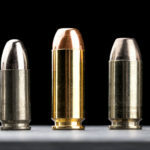 In addition, the pressures of different types of ammunition can vary wildly – this is, like many things I mention in this article, a topic for another day, but I saw pressures between 45,000 and 63,500psi while conducting this testing. The .223 Rem and 5.56 NATO max pressures of 55,000 and 62,000psi, respectively, do not mean that you will actually get ammunition loaded at that pressure. .223 tends to be loaded lighter and 5.56 tends to be loaded hotter – but there are exceptions to these general rules. Summary: Instead of there being two or three or four possible chambers (.223 Rem, .223 Wylde, 5.56mm Noveske, 5.56mm NATO) and two possible pressure levels of ammunition (.223 Rem and 5.56mm NATO), there are a nearly infinite number of points between the extremes. This can result in differing pressures with the same ammunition. It’s possible to ensure that you have something closer to the chamber you want to buy via purchasing a high quality rifle (or upper receiver assembly, or barrel) from a known source. 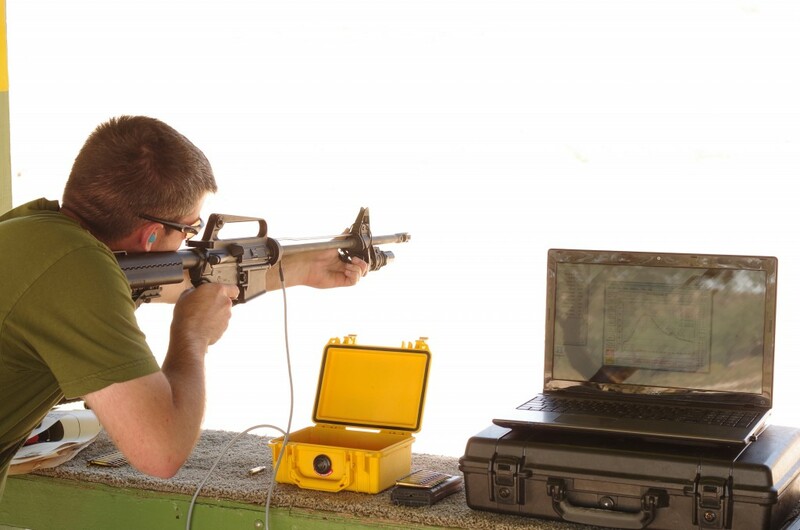 In order to test how 5.56 and .223 ammunition behaved in different chambers, I used a .223 Remington bolt action rifle and two 5.56mm AR-15 rifles, strain gauges, and pressure monitoring equipment. All gauges were attached at the midpoint of the case, which is where SAAMI tests pressures; military/NATO pressures are measured at the case mouth. All three barrels were 20″ in length. The Weatherby Vanguard Compact .223 Remington barrel had a twist rate of 1/12 and was not chrome lined; the FN 5.56 barrels were 1/7 twist and chrome lined. Federal XM855 ammunition and FN 20″ 5.56mm AR platform rifles were some of the ammunition and firearms tested. Because I’ve just finished explaining how there can be a wide variety of dimensions for a given chamber, it should be fairly obvious that a small sample size of chambers for pressure testing cannot possibly represent every possible combination on the market. However, I felt that it was better to test a large amount of ammunition in a few rifles than only a few rounds in a large amount of rifles (the results were still quite educational). Most of the ammunition tested was manufactured by Federal – AE223 and XM855. 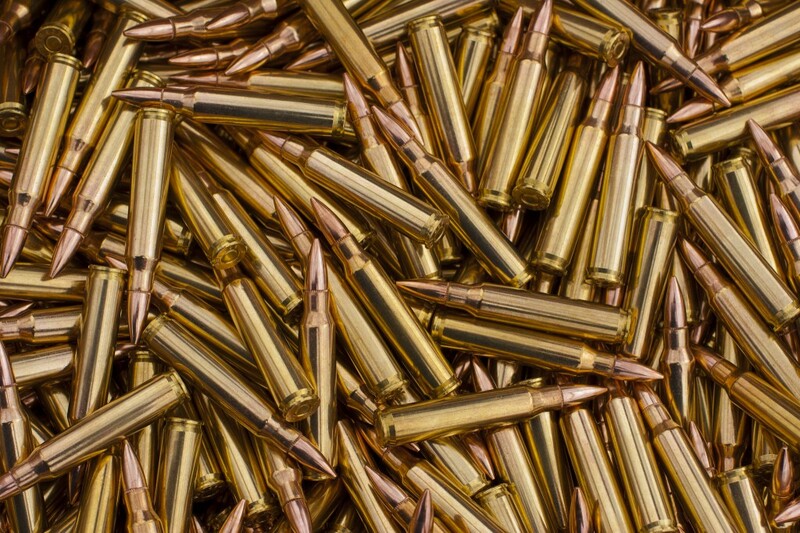 These are representative of the more popular types of ammunition on the market – 55 grain FMJBT .223 and 62gr steel penetrator FMJ SS109/M855, which is currently used by the military, although it has begun to be supplanted by other types of 5.56 ammunition. 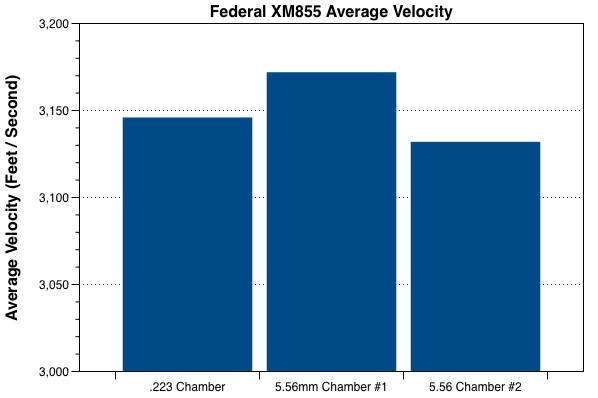 Here’s a sample pressure graph of Federal XM855 in a 5.56mm chamber, with velocities and pressures that match Federal’s specifications for the ammunition. 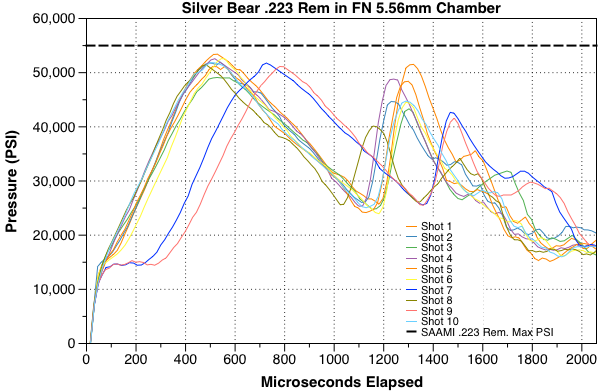 As pressure curves for production ammo go, these ten shots of Federal 5.56 ammo in an FNH-USA 5.56MM chamber were relatively consistent. 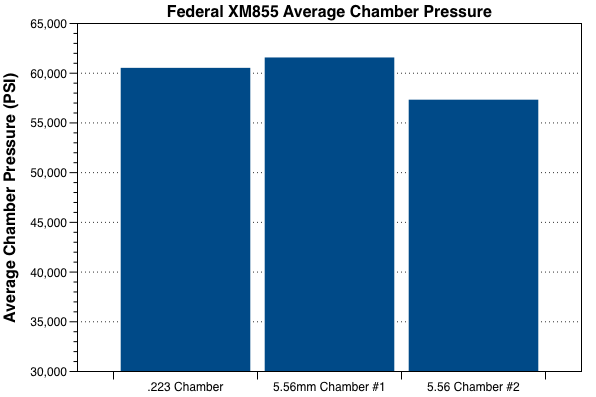 The observed chamber pressure for Federal XM855 5.56mm ammunition in a .223 Rem chamber exceeded .223 maximum pressures, but not by a massive amount. 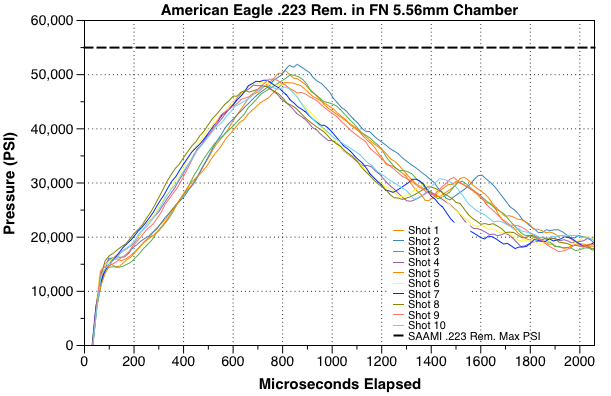 The ninth shot (the red line separate from the others) was an underpowered cartridge which exhibited significantly lower velocity and pressure than the other rounds, so it was excluded from the average velocity and pressure numbers for this chamber, because it would unnecessarily skew them too low. Federal AE223 was loaded consistently and offered significantly lower pressures in 5.56mm chambers, while still cycling the actions of mil-spec AR platform weapons. 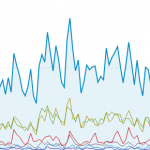 The secondary pressure spikes seen in this graph may be discussed in a future article on LuckyGunner Labs. The secondary pressure spikes and ignition delays seen in this graph may be discussed in a future article on LuckyGunner Labs. Because of their consistency, and because .223 Rem pressures should be at least more similar from barrel to barrel than 5.56 pressures, Hornady .223 Remington ammunition was used as a “calibration load” for the pressure monitoring equipment. In essence, it is required to use a load of known pressure to calibrate the equipment and provide a useful comparison with any other type of ammunition or chamber. This method provides a much closer and more useful comparison than the differences between SAAMI and NATO testing methods. How the strain gauge comparison can be useful is to see what increases in pressure result from the use of different types of ammunition in each chamber compared to that calibration load. 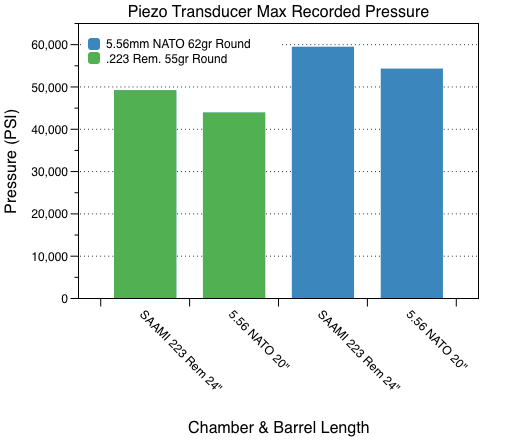 If we eliminate other variables and see a massive increase in chamber pressure from .223 to 5.56 in one barrel that we do not see elsewhere, we know that the dimensions of that chamber are different enough to cause that increase. Strain gauges and a PressureTrace II system were used to collect the data shown in this article. In order to ensure that I was getting the most accurate maximum average pressures possible, I contacted the manufacturers of a number of different types of ammunition with the results I had found. Of the manufacturers that responded, none informed me that my maximum pressure results were inaccurate (although they were understandably reluctant to disclose their proprietary data). Summary: I tested .223 and 5.56 ammunition in one .223 and two 5.56 rifles with pressure monitoring equipment. 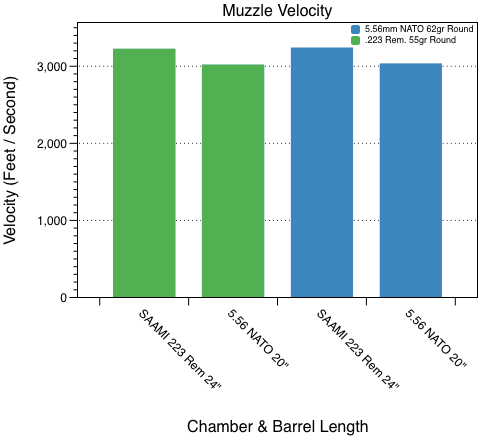 While the results are not perfect and cannot provide absolutely equal comparisons between barrels due to chamber dimension differences, my calibration/baseline maximum average pressure results were confirmed to be accurate by several different ammunition manufacturers. What Happens When You Fire 5.56 Ammo in a .223 Chamber? I know most people are interested in this part – and yes, I really did fire 5.56 in a .223 chamber. I had a friend at the range with me at the time, and he stayed a good ways back when I did so. I was not concerned about what would happen, and as I expected, the results were not spectacular. However, I was surprised about the results I saw. There was no dangerous spike in pressure from firing 5.56mm ammo in a .223 chamber. While pressures were elevated in comparison to one of the 5.56mm barrels, they were slightly below the other 5.56mm barrel. 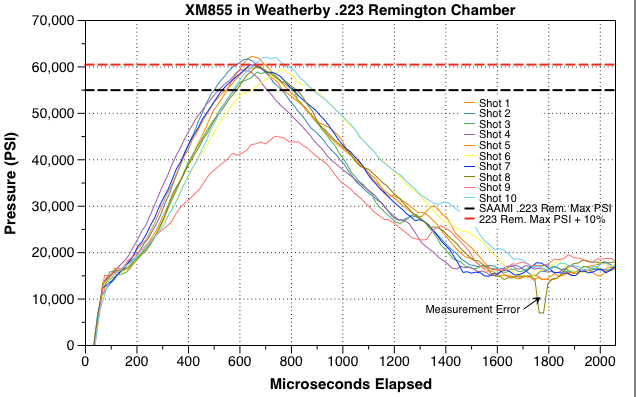 This unexpected difference was also borne out by chronograph measurements, which showed that the Weatherby Vanguard Compact bolt action rifle fired the XM855 ammunition (all of which was from the same lot) at a velocity which was higher than the lower pressure 5.56 barrel, but lower than the higher pressure 5.56 barrel. It’s true that the .223 barrel showed about 5% more pressure for less than 1% more velocity than the lower-pressure/lower-velocity 5.56 barrel, but the difference was not astoundingly large, as some might have expected. In fact, the higher pressure 5.56 barrel – which was in the same condition as and made on the same production line by the same manufacturer as the lower pressure 5.56 barrel – was putting out XM855 at an average velocity within spitting distance of 3200 feet per second. As my gunsmith friend has told me several times, velocity is a sign of pressure, and this second 5.56 barrel showed both increased velocity and increased pressure compared to the other two. Does this mean that everyone should start firing 5.56 in their .223 chambers? No. I must now go back to the “previous knowledge and experience” I mentioned that I had, for the most part, discarded when conducting this experiment. I have owned approximately sixty AR-15 barrels, with a fairly even distribution of .223 and 5.56 chambers, plus Noveske and .223 Wylde chambers. I have also owned numerous bolt action rifles chambered in .223 Remington. I have fired .223 and 5.56 ammunition in most of these barrels and rifles. Although my results are still anecdotal, I do not recall seeing anything worse than popped primers from firing 5.56 in a .223 chamber (or 5.56 in a poorly machined “5.56 chamber” that isn’t really a 5.56 chamber). It’s important to note that most of the .223 chambers I’ve fired 5.56 in didn’t show any signs of excess pressure, although I didn’t chronograph each and every one. If a popped primer lands inside a fire control group (where the red arrow is pointing), it could cause the weapon to stop functioning. Popped primers are definitely a sign of excess pressure or an abnormal pressure curve, and should not be ignored. 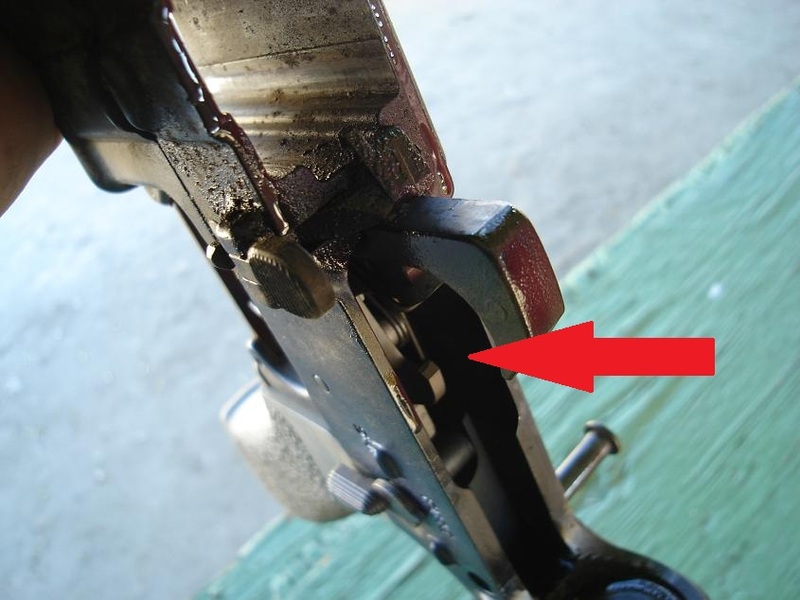 They can become wedged in some of the more important bits of an automatic rifle, causing it to stop functioning, and while this could be annoying at the range, it could also be fatal in a self-defense situation. Summary: Velocities and pressures for 5.56 ammunition in a .223 barrel were not significantly higher than the same ammunition in a 5.56 barrel; in fact, they were in between the two 5.56 barrels. This doesn’t mean that your barrel will have the same results, and you should always be aware of pressure signs when holding metal objects containing 50-60,000psi of pressure only a few inches away from your face. Shouldn’t Your Rifle Have Blown Up? My greatest concern while researching, experimenting for, and writing this article was whether or not I was putting out accurate information. In order to double check my results, I consulted with over half a dozen industry professionals, all of whom have far more experience in this area than I do. They work for highly respected laboratories, companies, and organizations. 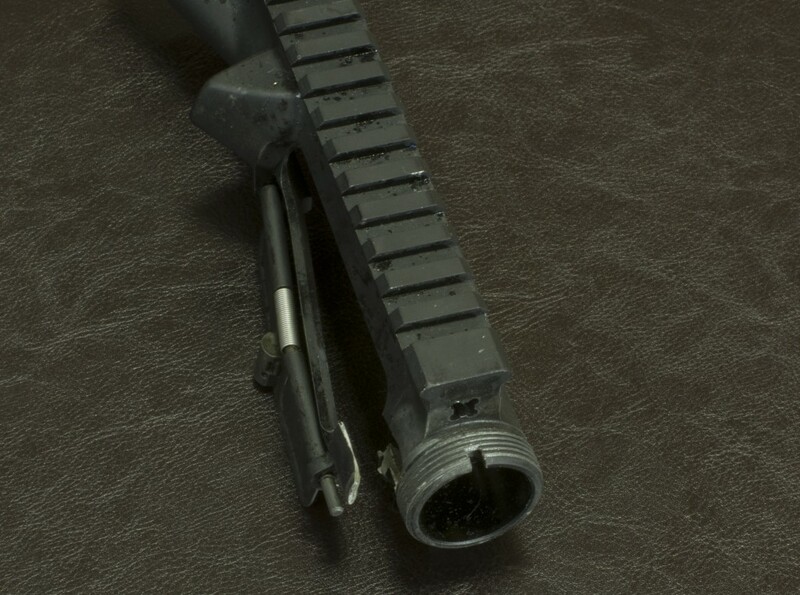 This AR-15 upper receiver was destroyed due to extreme overpressure, but this was not the result of firing 5.56 in a .223 chamber. That said, one noted gunsmith told me about a test he had heard of, conducted by an ammo manufacturer, in which 5.56 in a .223 barrel exhibited pressures of 77,000 PSI. I have no doubt that this is true and do not wish to cast doubt on what he said – however, I am also certain that that ammo manufacturer was performing the test with a SAAMI test barrel, which, as I said before, is much “tighter” than any barrel which is likely to be encountered in the real world. Barnes Bullets tested XM855 and AE223 in their test barrels for us, using the conformal transducer method at the midpoint of the case – the SAAMI method. Their results were slightly different from ours, which can be expected due to the different barrels and the different testing methods, as well as different lots of ammunition, but overall the results were quite similar. Note that the .223 velocities are higher because the barrel was 4″ longer. Barnes Bullets, manufacturers of high-end hunting and defensive ammo, tested 5.56 and .223 in their 5.56 and .223 test barrels. Their results did not show excessive pressures either. Velocities for .223 are higher than 5.56 because the .223 test barrel was four inches longer. Encountering an undersized chamber in the real world is likely, especially if it was manufactured cheaply and with little quality control procedures. Among some companies, there is a definite “race to the bottom” which can result in subpar and unsatisfactory components. I now spend just a little more money on my guns and equipment, and get a lot more quality. If you would like to check your 5.56 chamber to see if it really is 5.56, order a .223/5.56? Gage from Michiguns. Summary: The majority of the experts I consulted over the course of my research did not feel that there was a major difference between .223 and 5.56 chambers in terms of pressure. Don’t Hammer Forged Barrels Have Perfect Chambers? 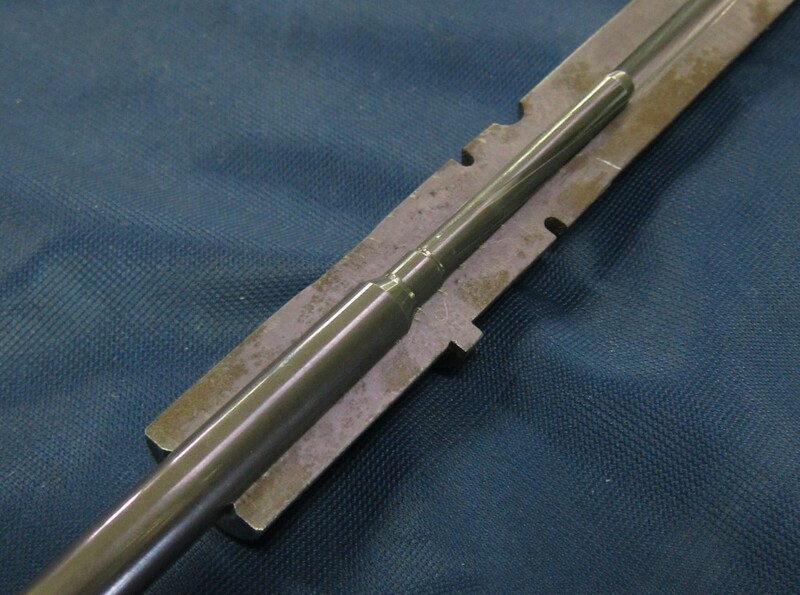 Without going in to too much detail about manufacturing processes which are not relevant to this article, one of the selling points that is often mentioned for hammer forged barrels is that the chambers are forged along with the rifling, meaning that they are properly sized and there are no worries about the quality of whoever reamed the chamber. In other words, a hammer forged barrel is squeezed into shape by immensely high forces over a mirror image of itself, and is thus less likely to have variances in rifling twist rate or chamber dimensions. This is somewhat true – some manufacturers do forge rifling and chambers with one mandrel, in one process. Others forge the rifling and then ream the chamber as a separate process, much like it would be done after cut or button rifling processes. I have observed seven hammer forges in operation, and discussed the pros and cons of both methods with a number of gunsmiths, engineers, technicians, and machinists in the United States and Europe. This hammer forged barrel cutaway has had a mandrel section placed inside the chamber to show how the barrel steel is “squeezed” over the mandrel during hammer forging. Companies like Beretta value the hammer forged chamber and rifling because it eliminates the inconsistencies – both in the “length” of the chamber and the alignment of the chamber with the rifling, which can suffer based on the quality of the employee performing the work – that result from performing the process separately. That said, they don’t use this one-step process for every barrel they make. On the other hand, Steyr, which has been hammer forging barrels longer than any other company, reams chambers in a separate process, in part because there can be issues with the way the barrel steel “flows” around the neck of the chamber, negatively affecting accuracy. Steyr’s focus is on precision, and employees take their time ensuring that each barrel has been forged exactly right, and each chamber has been reamed – and then polished by hand – correctly. 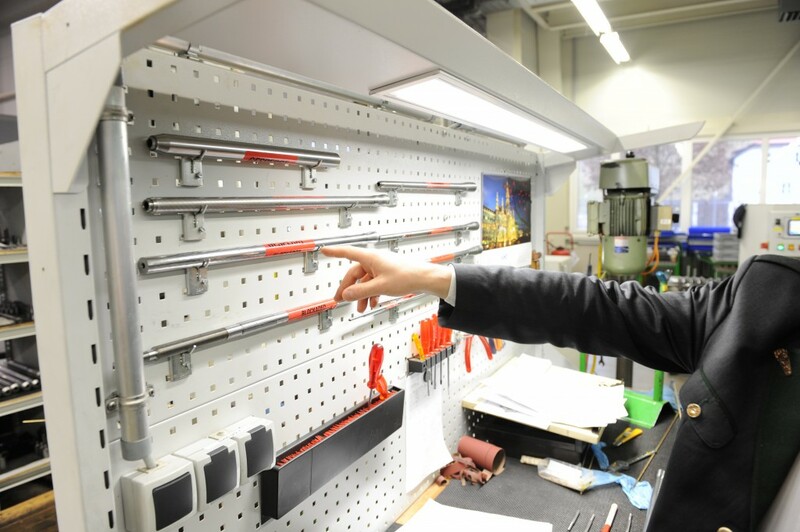 At this quality control station, a Steyr employee points out the standards to which each Steyr barrel is held during production. Both companies – and many others – put out fine products. Unless you’re just looking to buy a rifle and don’t really care how it was made, you would do well to research how the rifle you’re considering was manufactured, and what the manufacturer’s intent was when making it – long barrel life? precision/accuracy? reduced manufacturing costs? – and ensure that those goals match your own. Summary: Hammer forging chambers can help ensure that they are dimensionally correct, but so can a skilled and careful machinist with a reamer. Which Ammo or Chamber Should I Buy? It’s a good idea to have an understanding of all of the factors regarding this issue – and what you will use the rifle for – and make a purchase based on this knowledge. With that in mind, here are my thoughts on the four chamberings I’ve discussed in this article. .223 Remington – Because it’s the only SAAMI standardized cartridge, it’s the only one you’re likely to find used in rifles produced by major manufacturers. I would prefer any of the other three to “regular .223.” However, you will not be at a huge disadvantage as long as you buy mostly .223 ammo. As stated above, you are not likely to encounter major problems with limited amounts of 5.56 in a .223 rifle fired out of necessity or in an emergency. Doing so at a high volume for the long term is probably not a good idea. In terms of a carbine-style AR-15, I see absolutely no reason to purchase one with a .223 Remington chamber. .223 Wylde – Produced by a variety of smaller manufacturers, .223 Wylde can be an excellent choice if it is executed properly. I have personally had overpressure issues with improperly reamed .223 Wylde chambers. I’ve also had excellent accuracy and no pressure signs with 5.56 from properly reamed .223 Wylde chambers. As always, buying a quality product is often the best way to go. 5.56mm Noveske Match Mod 0 – Similar in concept to .223 Wylde in that it attempts to strike a balance between pressure and accuracy, it has the advantage of being produced only by Noveske, a shop known for precision and attention to detail. All of the Noveske barrels I’ve owned – about a dozen – have delivered accuracy, precision, and safe, reliable function. This comes at a price, for Noveske barrels are not cheap. 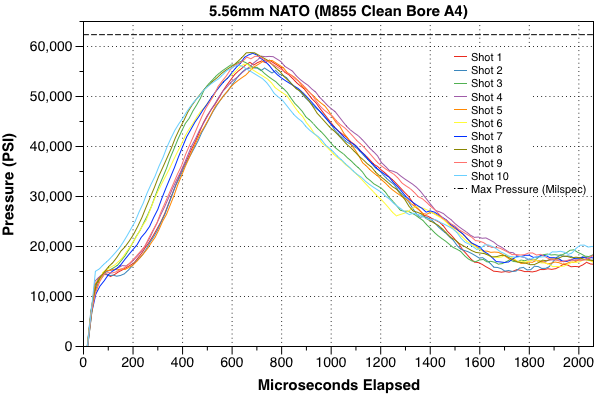 5.56mm NATO – The best bet for those looking to shoot high volumes of 5.56mm ammunition without an emphasis on tack-driving accuracy or precision, 5.56 barrels from reliable machine shops will outshoot most humans while also keeping pressures within normal limits. Cheap 5.56 barrels often disappoint. Summary: Buy a well-made rifle with the chamber you want based on your needs, shoot the right ammo in it, and have fun. For most people, especially those not sure of what type of shooting they’ll be doing, a 5.56mm chamber is the best all-around choice. It is my fervent hope that this article has helped you better understand the topic at hand.